Last Friday the Royal Horticultural Society, Nick Knowles and a shedload of volunteers did something wonderful at Cody Dock, transforming a rundown dockside near the mouth of the River Lea into a planted garden with the addition of raised beds and instant landscaping. This was the first salvo in the RHS's Greener Streets: Better Lives campaign aims which aims to create 6000 greener spaces around the country in the next three years. Between sunup and sundown dozens of volunteers helped create a flower-filled riverside walk for the benefit of the local community, and in anticipation of the area opening up to a wider public. It all sounded lovely. So last night I popped down for a look. But when I got to Cody Dock the gates were locked. They usually are, there isn't often public passage through the site, which remains a community asset waiting to be fully fledged. But that meant I had to squint through the railings and across the inlet to see what green revolution, if any, had been wrought. On the upstream side of the dock a sensory garden has been created, complete with turfed slope, wheelchair-accessible ramp and hooped willow fencing. A most peculiar central feature involves two half tree trunks each with a stainless steel pipe attached, apparently for blowing bubbles, and installed over a much longer time period than a single day's intensive pop-up. The whole thing looked more Ground Force than Chelsea Flower Show, but what do I know? Alas the RHS's main transformation was far harder to see. Although all Friday's press reports showed a lush verdant oasis of blooms, none of this was immediately apparent from the other side of the inlet. 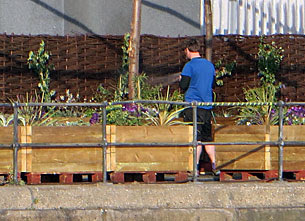 All the hard work appears to have taken place on the eastern quayside and up the approach road, where dozens of raised beds are in place and overflowing with flowers and foliage. I also spotted someone busy watering them, which is no mean task, and just as well in this warmer weather if the RHS's green gift is to survive long term. But because Cody Dock's new garden isn't on public land, essentially I saw nothing, and so wandered back up the cul-de-sac path unfulfilled. But things are due to change. I know I've been saying this in reports since 2009, but there are still plans to open up this stretch of the river, completing a 30 mile path along the Lea from Hertford to the Thames. All the upstream stuff exists, but the last mile has long been blocked by wharves and industry, so walkers have to divert down the Limehouse Cut instead. Originally the new link was to be called the Fatwalk, potentially one of the worst brand names ever, but the current project refers to the Leaway, which can only be an improvement. 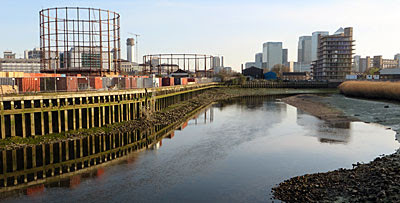 'All' that's needed is a short riverside connection from Cody Dock to Canning Town, and from there either to Trinity Buoy Wharf or the Dangleway, whichever is the Mayoral preference. Yeah, obviously. Meanwhile another transformational project is almost complete, this time bringing world class sculpture to the Lower Lea Valley. It's called The Line, and plans to create an outdoor art trail connecting Queen Elizabeth Olympic Park to the Millennium Dome. As far as possible the route follows the Greenwich Meridian, but with an awkward diversion via DLR and cablecar to get round the blocked riverside south of Cody Dock. Crowdfunding took place last spring, and the whole thing was planned to be open by early summer 2014, but it turned out that juggling acquisition, security and access was far more complex than the organisers anticipated and the project will be now delivered approximately twelve months late. Barring last minute hitches The Line will open on Saturday 23rd May. Sculptures will include works by Eduardo Paolozzi and Martin Creed, with Cody Dock getting 'Sensation' by Damien Hirst which should bring punters flooding in. Even better The Line promises 24 hour access, which should mean that Cody Dock's gates are unlocked permanently, creating a genuine public right of way where currently there's only a Lea-side dead end. I'll believe it when it happens, but by golly after all these years it's about time. But don't expect completion of the long-promised Leaway riverside walk. No public access has yet been driven through the rear of the Electra Business Park, and the improvements at Canning Town aren't due to be complete until this time next year. A new lifting bridge across Cody Dock is also required, apparently, and this isn't even funded. Instead for the foreseeable future those following The Line will have to head out into the adjacent industrial estate, which is visually very unappealing, bypassing the RHS's trumpeted avenue of wooden planters and timber pergolas. And there's one more fly in the ointment at Cody Dock - the neighbours. Trying to create a communal oasis by the Lea is all very well, but when the company nextdoor are allegedly polluting the area, that makes life tricky. Orion Services' waste transfer station has caused Cody Dock's tenants and visitors to suffer from "unacceptable levels of dust, projectiles, odour, fly infestations, noise and heavy vibrations", resulting in "cancellations and closures of family and volunteer days and tenant abandonments". Orion are currently seeking retrospective planning permission for a shed they built on site last year, causing Cody Dock to put together a petition with over 500 signatures. Reading the public comments on Newham's planning portal (application no 14/03084/FUL) reveals no love lost between the two sides. "This year for the Big Draw we had animals and birds come to Cody Dock for people to draw. We had the event inside, but the event was seriously impaired by the smell, dust and most of all the constant stream of flies." "Me and both my sons work for Orion. I work on site and my sons drive. A new larger shed will not only improve my working conditions and the area but it also gives my family more job security. It must be approved." "They do not seem to care what time they start or finish driving and smashing things. This makes it impossible to have private hires and community events in the evening." "Everyone says how we need to recycle more then they try to stop a modern facility being built that employs 150 people. Go figure." "It's clear that Orion and Cody Dock cannot exist as neighbours - their activities are not compatible. Of course each organisation has it's own validity and is important in it's own right. However it is not possible to move Cody Dock anywhere else." "We are deeply concerned that approval of this application will result in Cody Dock no longer being viable." Photos of the RHS's transformational event on Friday make Cody Dock look amazing. Viewed in the opposite direction, however, Orion's stack of waste looms over the site like a mountain of misery. It'd be a damned shame if this burgeoning community hub was forced to close because the surrounding environment had become too inhospitable. Let's hope the two sides can live together, so that sculpture and horticulture can help to bring the crowds to this unique and unsung corner of the capital.